But I am very happy to have Desmond Mpilo Tutu, retired Archbishop of Capetown in the Anglican Church of the Province of Southern Africa, as my witness to the Incarnation who represents Joy–even if I put Joy in the wrong week. 🙂 From the time I first became aware of Tutu (c. 1982), I noticed in him the great joy of Christian faith–even in the midst of nonviolent struggle against great oppression; even as the recipient of so much hate. When the late (and, by me, unlamented) Jerry Falwell, acting at the prompting of the Reagan admin., denounced Tutu as a Communist and phony Christian, I was so horrified that I dared something I had never done: I wrote to both of them. At the time, I was an unknown student at an unknown, small, conservative, Christian college–recently out of the U.S. Army with a conscientious objector discharge and trying to follow my calling to serve God wherever that might lead. I didn’t know, then, that there were Baptists in South Africa and that Tutu, with his broad ecumenical experience, would know enough about Baptist polity to realize that Falwell was not–could not–speak for other Baptists. I knew that, often enough, Christians in other, more heirarchical traditions, did think that famous (or infamous) Baptist preachers could speak for other Baptists and give official pronouncements of doctrine, ethics, public policy, etc. I could not let this brave Christian leader think that Falwell’s horrific and bigoted pronouncement represented some general feeling of Baptists. I wrote Rev. Falwell and was polite as I knew how to be, but basically called on him to repent for his obvious racism. I never received a reply. I also wrote Tutu, then the Bishop of Johannesburg, in care of the South African Council of Churches. To my surprise, I received a personal reply–which remains one of my fondest possessions. As he thanked me for my prayers and support, joy and Christian love leaped off the handwritten pages of stationary. That was May, 1985 and my involvement in the U.S. “Free South Africa” movement dates from that moment. I have since read most of Tutu’s writings and a few secondary sources, although I cannot be counted a Tutu scholar. What follows is a bare bones account of his life and work–with an emphasis on how he witnesses to the joy of Incarnation. Desmond Mpilo Tutu was born in Klersksdorp in the Republic of South Africa in 1931–a time when South Africa was ruled by whites for whites, but prior to the Nazi-like racism of the Afrikaaner policy of “apartheid.” When he was 12, the Tutu family moved to Johannesburg where he was educated in segregated schools (Bantu schools). The young Tutu wanted to become a physician, but the family could not afford the education and so he decided to follow his father in becoming a schoolteacher. He underwent teacher training at Pretoria Bantu Normal College (1951-1953) and then taught at the Johannesburg Bantu High School and then Muncieville High School (where he met his wife, Leah) until 1957 when he resigned in protest of the Bantu Education Act–an act which would consign poor South Africans (especially non-whites) to inferior education. In 1958, he followed a vocational leading into the Anglican priesthood, studying as a candidate for ordination at St. Peter’s Theological College, Rosettenville, receiving his Licentiate in Theology in 1960 (the year of the Sharpeville Massacre–when white South African police fired live ammunition on black schoolchildren who were unarmed and nonviolently protesting the conditions of their schools!) and becoming an ordained Anglican priest in 1961. He was chaplain at the University of Fort Hare (one of the places where Africans could get quality education in Southern Africa) which was a hotbed of dissent and anti-apartheid resistance at the time. Tutu’s superiors thought that he was becoming “too political” in his involvement with those committed to the struggle. They suggested he resign as chaplain and sent him to London to pursue further studies while things cooled off. Tutu matriculated at King’s College, University of London from 1962-1966, earning a Bachelor of Divinity degree (with highest honors) and Master of Theology degree while serving as a part-time curate or pastor. In 1967, Tutu returned to South Africa and became once more the Chaplain a the University of Fort Hare and a member of the faculty of the Federal Theological Seminary in Alice–and used his lectures to highlight the circumstances of the African population. In 1970, Tutu became Lecturer in the Department of Theology of the University of Botswana, Lesotho, and Swaziland, continuing his policy of relating his theological lectures to the circumstances of the South African struggle. He wrote a letter to the Prime Minister (Voerster) and described the situation in South Africa as “a powder barrel which can explode at any time.” He was not answered. Tutu returned to South Africa in 1975 and was appointed the Anglican Dean of St. Mary’s Cathedral, Johannesburg–the first African to hold such a post. The very next year, 1976, was the year of the Soweto Uprising. Students and others in Soweto (a segregated non-white “township” next to Johannesburg) protested the government’s rule that Afrikaans be the only language in education. The government responded with deadly force and the nonviolent protest became a riot. As a result of this,Tutu called for a worldwide boycott of South African products. It took years and was full of holes, but international sanctions and citizen boycotts of South African goods, entertainment and sports boycotts of South African venues did slowly put increasing pressure on the white government to end apartheid. (Ronald Reagan reversed the sanctions of the Carter years, themselves incomplete, and preferred a policy of “constructive engagement” which amounted to turning a blind eye to South African injustices because South Africa claimed that all the movements for non-racial democracy in Africa were fronts for Communism! It was in this context that Falwell’s “phony” remark was made.) In 1976, Tutu was consecrated Bishop of Lesotho. As the South African government kept banning the political parties and organizations of protest and struggle, including the African National Congress, many unions, etc., the struggle against apartheid became more and more a struggle led by the black and “colored” or mixed-race churches (with a few valiant white Christians, too). The World Alliance of Reformed Churches (WARC) suspended two Afrikaaner Reformed denominations for the heresy of theologically justifying racial apartheid. Other global pressures were increased, too. Meanwhile, the vehicle for the church struggle against apartheid in South Africa was the South African Council of Churches, to which Desmond Tutu was elected General Secretary in 1978. Tutu led nonviolent marches, gave speeches and sermons (which were collected and republished here in the U.S., where I began to read them) that related faith to the struggle against apartheid. But he also was highly critical of those who would use violence or preach hatred against whites. He was repeatedly arrested. The government blamed him for everything–such as when he risked his life to stop the “necklacing” of an informant (this was a horrible practice wherein a mob would surround someone who cooperated with the apartheid regime, stick a rubber tire filled with gasoline/petrol around said collaborator’s neck, and set it on fire) and then was blamed for the attempted murder! In 1984, in recognition for his leadership in the nonviolent struggle (and in honor of all the thousands who participated in it), Tutu was awarded the Nobel Peace Prize. (He was the 2nd leader of the anti-apartheid struggle to receive the Nobel: the first was Chief Albert Luthuli in 1960–the Zulu Chieftain who founded the African National Congress and set it on its early path of Gandhian nonviolence. The 3rd Nobel for the anti-apartheid struggle would go to Nelson Mandela, sharing it with F.W. de Klerk, the white president, for their mutual work to end apartheid and introduce multi-racial democracy without further violence.) He has received numerous other awards and honors for his work for peace and justice. In 1985, Tutu was elected the Bishop of Johannesburg and in 1986 became Archbishop of Capetown–each time becoming the first black African to hold the post. After the fall of apartheid and the institution of multi-racial democracy in 1989, Tutu began a new role–now, not as one of the leaders of nonviolent struggle for justice, but as a healer of a strife-torn nation. In 1995, Tutu was asked to head South Africa’s “Truth and Reconciliation Commission” which, in place of war crimes trials or cycles of revenge, asked oppressors and victims to tell publicly the crimes they had committed and receive pardons. The cycle of violence had to be broken, not by hiding but by telling the truth and allowing people to begin anew. This has now become a model for similar truth and reconciliation commissions in other war torn or strife torn situations. (I often wonder if the history of my nation would have been different if we had held such commissions after the Civil War or, again, in the wake of the Civil Rights movement and the fall of legal segregation.) For this work, Tutu received the Sydney Peace Prize in 1999. Since retiring as Archbishop, Tutu has worked with the PeaceJam movement to inspire youth around the world to work for peace and justice. He has also worked to end the plague of AIDS (and its stigma), championed the ordination of women, and called for the full inclusion of gay, lesbian, bisexual, and transgendered people in church and society, called for Middle East Peace (and worked to get Nobel Peace Laureates to mediate between Palestinians and Israelis) and much else. Joy has permeated his entire life and work–the joy of a witness to the Word Made Flesh. My post on the “military Bibles” has led to a few misunderstandings I need to clear up. I do not object to the distribution of Bibles to members of the U.S. military or any other military. I support every effort to distribute Bibles as widely as possible, including the sale of Bibles along with free distributions. My only objection to a free giveaway event is if there is sponsorship or co-sponsorship by government or a government agency in violation of the First Amendment’s ban on either hindering or promoting religion. I support evangelistic outreach to members of our military or any other military. Even during the early centuries of the church when it was nearly universally pacifist, there was strong outreach to Roman soldiers. Many Roman soldiers converted to Christianity, often after seeing how calmly Christians were martyred. Some of these soldier-converts quickly became martyrs themselves when they refused to fight and kill after becoming Christians. Today’s pacifist Christians too seldom establish the kinds of relationships with military personnel and their families that would allow for conversions. As a former soldier, I am glad that I was welcomed by the Baptist congregation in Heidelberg (uniform and all), even though the pastor was pacifist. How else would I have converted to gospel nonviolence? Standing up for gospel nonviolence and being convinced that God does not want Christians to serve in militaries has nothing to do with condemning those who, for now, believe differently, nor anything to do with disrespecting the courage and self-sacrifice of military personnel. My objection is not to the Bibles, but to their “packaging” with covers that seem to support war and violence and with “extra” features described in my last post which promote violence, nationalism, militarism–the reduction of the God of the universe to a tribal god of one nation. That is idolatry, even blasphemy. One commenter said that this was no worse than other “niche marketing” Bibles–the Serendipity Bibles, Women’s Bibles (usually anti-feminist in tone), teen adventure Bibles, etc. To this I have two responses: 1) I oppose these kinds of “study” Bibles, too. Now, there is nothing wrong with real study Bibles–equipped with scholarly notes that help the reader with background information, etc. There is nothing wrong as long as these study Bibles make clear the difference between the text of Holy Scripture and the notes of human scholars. Unfortunately, I have found that laity, especially laity with less education, often find it difficult not to treat the notes as just as inspired as the text. This is even more the case with children and teens. The non-scholarly theme notes of “niche market” Bibles have further problems: They encourage an individualistic and spiritualistic reading of Scripture that fundamentally distorts the gospel. They undermine the Bible as the church’s book, to be read in community. Instead, they encourage not just personal Bible study in one’s own private life, but privatized Bible study (“Me and Jesus got our own thing going”) that remakes Christian faith into something one does with one’s spare time. They promote passivity in the face of the gods of consumerism, materialism, and other “isms” of contemporary global imperialism. I do not say this is the intention of the editors of these niche market Bibles, but merely that these detrimental effects undermine the health of the Church and churches, especially undercutting any sense of the People of God as a distinct community, a contrast society to the mainstream culture (what the Johannine writings call “the world”). So, I find these niche market Bibles highly problematic. 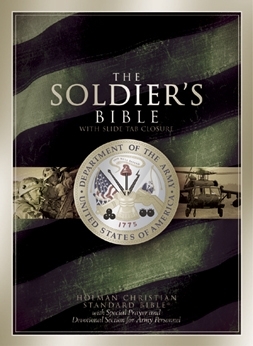 2) Despite my comments above, I do believe that the “military Bibles” are WORSE than other “niche market” Bibles. Those other Bibles can create bad habits in Bible reading that have detrimental effects, but I have not seen any that are heretical in and of themselves. That is not the case with the military Bibles. They promote the idolatry of nationalism. They do not simply reach out to soldiers (sailors, marines, etc. ), but justify war (at least when the U.S. wages it). That is not just heresy when viewed from a pacifist viewpoint, but even from a “just war” standpoint. Traditional just war theology says that some evils must be resisted even by violent force as a “lesser of evils,” but does NOT glorify killing or militarism. The “extra features” of these Bibles do just that–turning Jesus from the Prince of Peace to a war god. That is blasphemy–pure and simple. It must be denounced by all Christians. “Twelve men went out from Jerusalem into the world, and they were unlearned men, unable to speak [i.e., unable to speak eloquently because not trained in Greek rhetoric]; but by the power of God they told every race of humanity that they were sent by Christ to teach all people the word of God. And we who formerly slew one another not only now refuse to make war against our enemies, but for the sake of not telling lies or deceiving those who examine us [i.e., investigators charged with getting them to confess to the crime of being Christian], gladly die confessing Christ.”–Justin Martyr (c. 100-165). In a description of the early Christian movement to the Roman Emperor about the year 150. 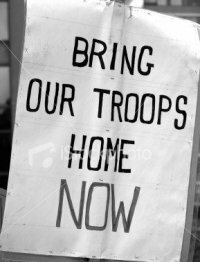 Cindy Sheehan, George Will, and Loving Your Enemies. 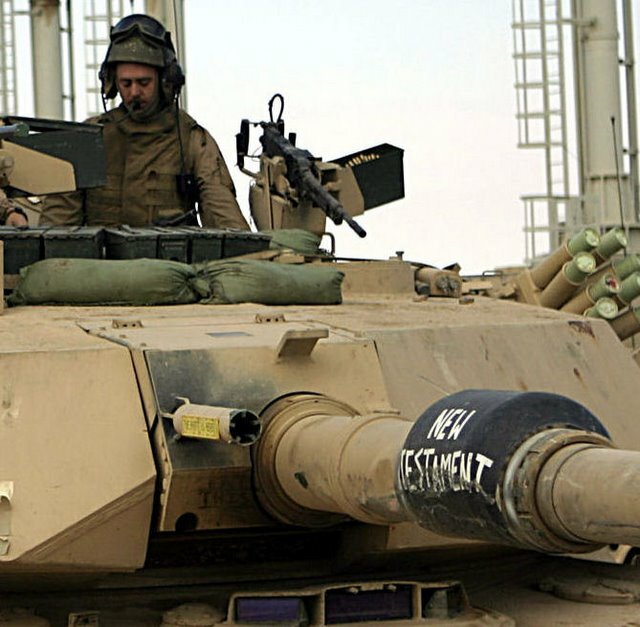 Soldiers in Iraq have been giving nicknames to their tanks. This one was blasphemously called “New Testament.” Calling darkness light is a huge sign of the apostasy of modern U.S. Christianity.